Seven times a day someone in this country dies in a fire. The American Red Cross serving San Bernardino County has been working to reduce that number through the Home Fire Campaign, a multi-year effort in conjunction with Prepare SoCal to reduce the number of home fire deaths and injuries by 25 percent. The Ontario Home Fire Campaign will be held on Jan 14, 2017 from 8:00 a.m. to 1:00 p.m. Volunteers needed, no experience necessary! You can register for the Ontario Home Fire Campaign at http://tinyurl.com/2017HomeFireJan14. 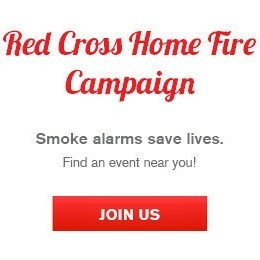 Launched in October of 2014, the Red Cross and thousands of campaign partners have helped save numerous lives through the effort, as well as installing more than a quarter million smoke alarms in homes all across the country. PrepareSoCal is an American Red Cross multi-region campaign designed to address the needs of individuals and families to prepare for disasters, small and large, by providing tips, tools, and training, and to promote community resiliency with a focus on Southern California’s most vulnerable communities. Next Patients who rely on blood and platelet transfusions need your help now!